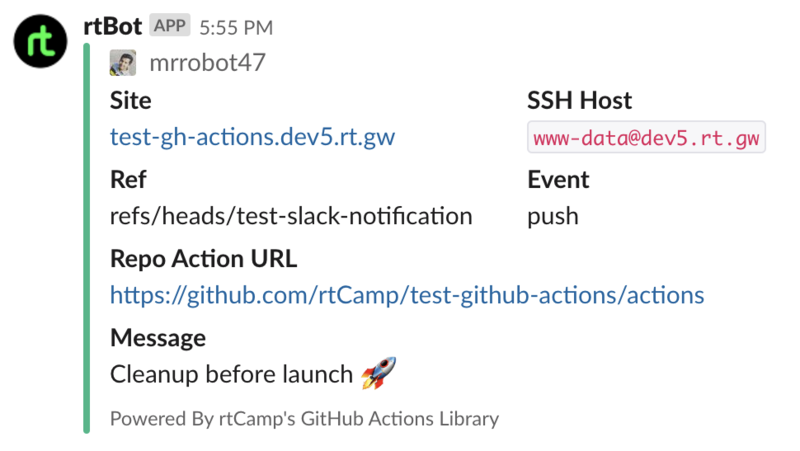 Want to be notified of new releases in rtCamp/action-slack-notify? A GitHub Action to send a message to a Slack channel. The Site and SSH Host details are only available if this action is run after Deploy WordPress GitHub action. 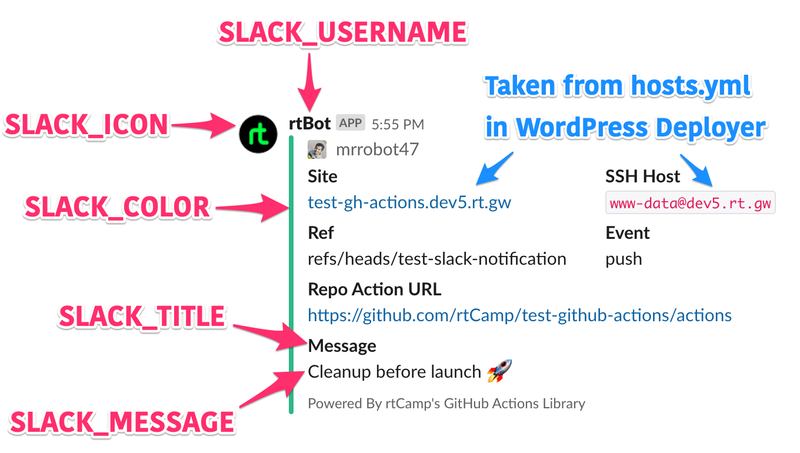 Create SLACK_WEBHOOK secret using GitHub Action's Secret. You can generate a Slack incoming webhook token from here. SLACK_COLOR good (green) You can pass an RGB value like #efefef which would change color on left side vertical line of Slack message. SLACK_MESSAGE Generated from git commit message. The main Slack message in attachment. It is advised not to override this. SLACK_MESSAGE = "Post Content :rocket:"
This GitHub action supports Hashicorp Vault. You will need to change secrets line in main.workflow file to look like below. GitHub action uses VAULT_TOKEN to connect to VAULT_ADDR to retrieve slack webhook from Vault. In the Vault, the Slack webhook should be setup as field webhook on path secret/slack.